Komori Corporation (Sumida-ku, Tokyo; President, Representative Director and COO: Satoshi Mochida) has integrated the two models in the lineup of 37-inch sheetfed offset printing presses, the Lithrone A37 and the Lithrone G37, into a single Lithrone G model* and updated the design. The following is an outline. 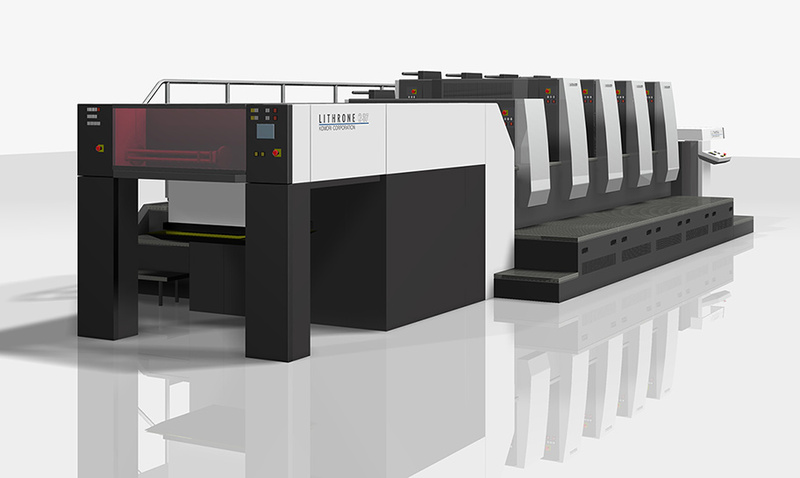 Komori Corporation has integrated the two models in the lineup of 37-inch sheetfed offset printing presses, the Lithrone A37 and the Lithrone G37, into a single Lithrone G model* and updated the design. Komori has achieved total worldwide sales of more than 350 Lithrone A37 (13,000 sph maximum printing speed) and Lithrone G37 (15,000 sph maximum printing speed) presses, which have won an excellent reputation. In this IGAS year of 2018, these two models have been integrated into the single Lithrone G series*. The press, with an updated exterior using the same silver tone as the Lithrone G26/G29 that appeared at drupa 2016, has been reborn as a new model combining both performance and design. All models from 26 to 44 inches have been unified as the Lithrone G series. By continuously introducing Komori’s state-of-the-art technology into the entire lineup, support for meeting customers’ diversifying needs is being strengthened. The Lithrone G37, while compact, can feed 640 x 940 mm sheets and has ample capacity to print 16-page A4 impositions. The lineup has been expanded to enable the high added value printing needed in package printing with a press that meets strong market demand since 2017 and has specifications offering compatibility with sheet thicknesses up to 0.8 mm, six or seven-color configurations with in-line coater and a skeleton transfer cylinder. Like the Lithrone G40, the Lithrone G37 can be equipped with benderless Full-APC (Fully Automatic Plate Changer) and technology that greatly shortens makeready time. Options for quality control such as the PDC-SX Spectral Density Control System, the large KID Komori Info-service Display and the PQA-S Print Quality Assessment System for Sheetfed can also be specified. Komori’s expanded lineup and bolstered support will lead to greater profit for customers. * Models remain in some areas. *Maximum printing speed varies with printing conditions. *Performance and numbers may differ from specifications. Specifications may also be modified for product improvements. *Model in CG image includes options.